views of travelling through space? the ship in Noctis. That was just a room, with a cupola on the roof. I'd hate to lose this beautiful view of moving through space. Don't mean to sound negative, I'm just a bit confused. Another question, why does it need to be so big? No view screens? The mother ship will carry on-board shuttles, and it will have an in-built plant where new shuttles, modules and other devices can be manufactured. Will it have a bridge??? 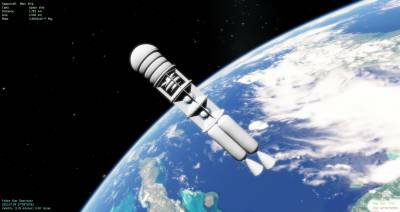 Of course this spaceship will have no windows, except the observation decks and small shuttle-crafts and repair bots. There are holographic displays in the control room of the Mother Space-ship. Holographic means that they are similar to window: you can walk up to a display and see the parallax effect. But it is not a true window, due to the location of the control room deep inside the spaceship, it is behind thick armor. The deck is not like in Star Wars, there the control bridge has huge thick glass windows that sticks out high above the ship's hull. One hit - and the Empires' Star Destroyer is deprived of a Captain:) Window-like displays are simple to implement in the game's graphics engine, using a "portal" technology (in the indoor-enviroment engine, portal is a polygon that lead renderer to another part of a scene). In addition to holographic screens I think about the "virtual reality helmet" or "neuro-interface", which gives the player the ability to control a ship in first person mode, without an image of a cockpit that obscures your view. I.e. like it is currently with the SpaceEngine interface. Some players like this mode in SE, some prefer cockpits. This is a compromise! 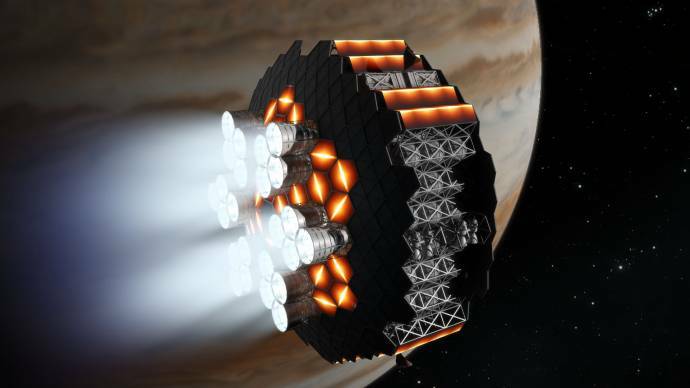 A player can walk to another ship and have the ability to immediately switch to another ship control mode, wherever he is on his ship: The hemlet or neuro-chip is always connected to the ship's main computer. I like this idea. Will you be able to design the ship? Will it be procedurally generated? 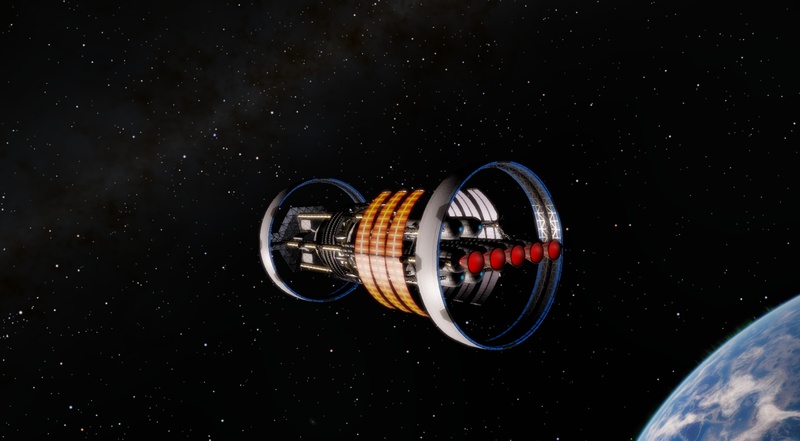 It would be awesome to slowly upgrade and expand your mothership as you explore and build more. 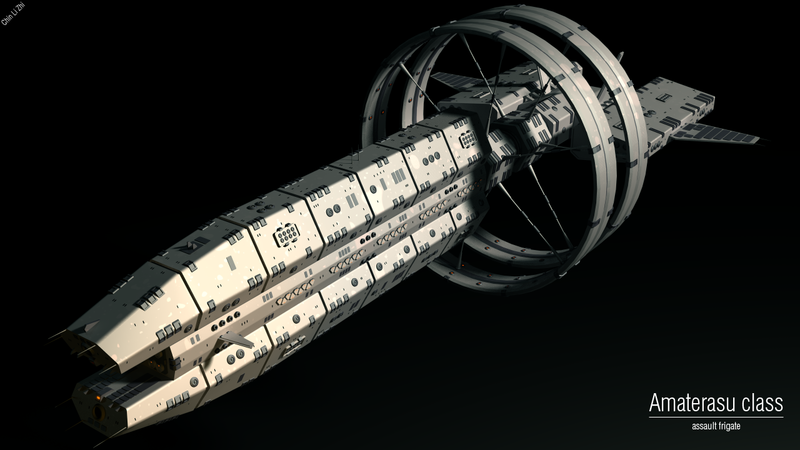 I think I will make separate modules for the ship model. That will give players the ability to upgrade ships with each new release of the game. as did Star Trek. But I can live with a view screen ala enterprise. Really disappointed there'll be no cockpit. I am really impressed! Your mothership concept sounds absolutely fantastic. I hoped for something like this. the bridge would be really awesome! At the end that seems to be a really well-thought concept. resources. That's what I wanted to hear! Space combat is ok. I always forget that large-scaled universe. It's really impossible to have close-up fights with a speed up to 10.000 km/s. 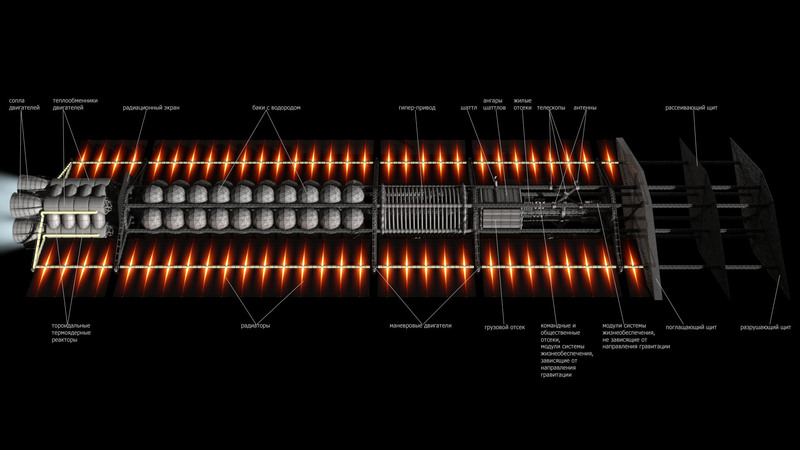 directed into sensors, weapons and shields, for example). But I easily can live with your realistic version. And I agree, alien races are absolutely nessessary! Space would be very empty without. Thanks for sharing that info! Now it's even harder for me waiting for the release! So is there a possibility of being able to play the game as different crew members? Like navigator, engineer, security, etc? I have started working on the spaceship. 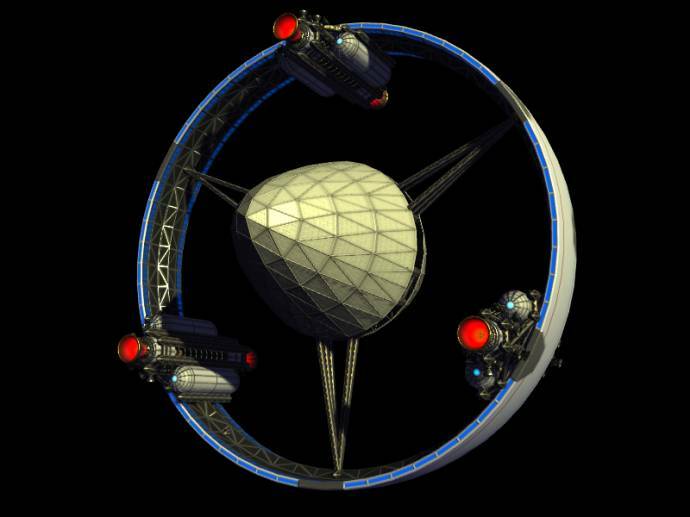 In parallel I will make conceptual mothership model in 3ds max. I would be content to have seen some basic hand drawings first on your proposed concept at this stage. I too, don't quite get the 'skyscaper' idea for the space-ship. Perhaps it will become clearer when I finally see the 3ds model. From top to bottom: Shield, 3 habitation and cargo modules, reactor, 2 hyper-pressure hydrogen tanks, 2 engines. The heat radiators, observatory and refueling system are missing here in model. Looks excellent, and quite realistic. I like the ship designs in game likes EVE but the design you posted above seems more like how they would actually be designed in real life. Looks nice. Just like a modern spaceship would be built today. Believable and realistic. Reminds me of the Orion Project ship design. SpaceEngineer, I think you should think a little more thoroughly about the implications of the technology in the game. If we’re serious about realism, even disregarding the FTL drive, we run into some contradictions and short-sighted extrapolation (notes follow). On the other hand, if we’re somewhere softer on the spectrum without straying too far from the hard end, I would urge that the exceptions be made only for enhancing gameplay (suggestions follow). There is a vast, complex membrane between the “possibility spaces” of technological realism and gameplay. I’ve been exploring it myself for many years, at least conceptually. 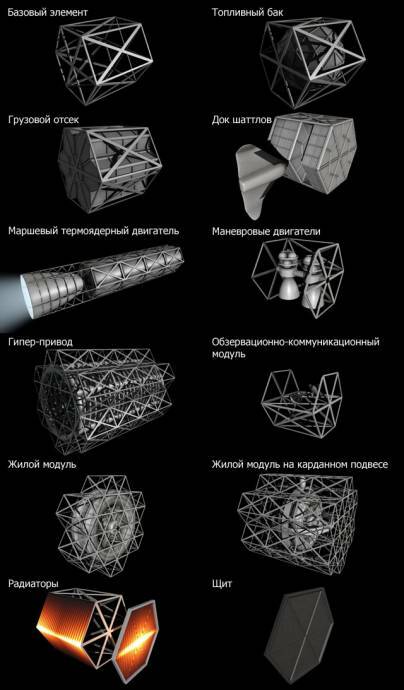 Keep in mind these notes are not all suggestions for additions to the game, they are what I think would be implied by availability of various technologies SpaceEngineer have mentioned. There are some suggestions for mitigating/incorporating these implications. 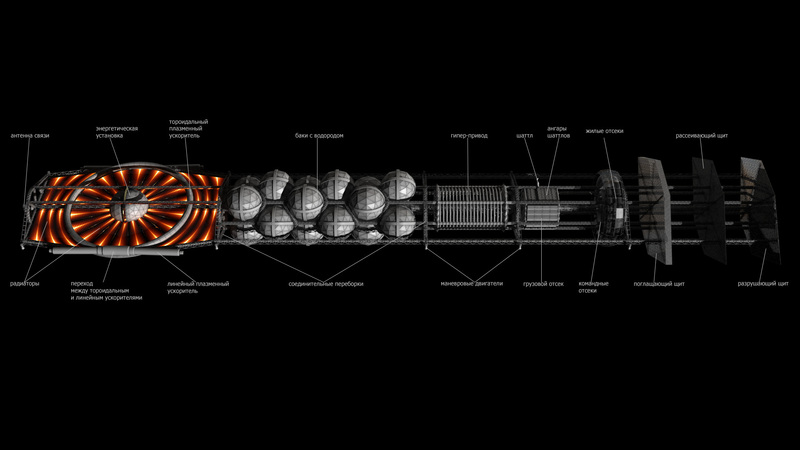 Zero Point Energy sounds just as implausible as the FTL drive. * Even if this didn’t replace ZPE, I think it would be very fun, strategic instrastructure construction gameplay; placing laser relay stations, ensuring things get constant power at range when the laser sources are in constant movement, etc, somewhat similar to this flash game. A cometary ice shield generates interesting gameplay; finding a suitable size (or lasing down a larger) icy body to grapple to after your current one runs out. I couldn't follow your translated response to SHW's original design. 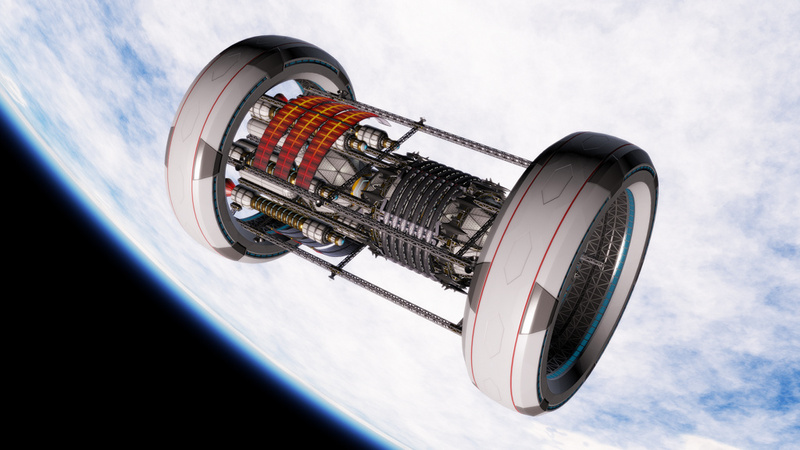 How do we deal with intense gravity from running the engines >1G? * Do we need a rotating ring if we have one of the above? It is a nice visual element... could auto-extend from the ship while at rest. How many people are aboard? How big is the crew? Passengers? How does the ship’s population tie into gameplay? About modularity (which is a fun gameplay element I’m in favor of): Even without nanotech, this level of technology would imply that modularity may not look familiar to us. We’re used to an external machine “retrofitting” a new module bought from some starport, swapping it out with another module along a central truss or something like that. The SE ship, given resources and its own fabricators, should be able to “mutate”, for lack of a better term. The ship should be self-sufficient, and its design should reflect that fact. 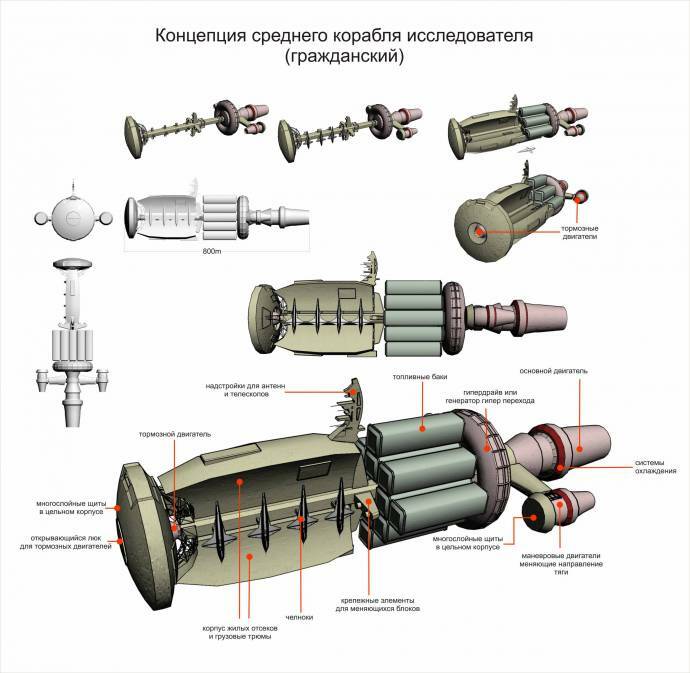 In any case, even without ZPE or Nanotech, as much as I love SHW’s design (If you hadn’t figured, I’ve been reading the Russian mothership thread via Google translate - at one point I think it translated “mothership” as “ship-to-uterus”!) and other realistic designs like it (including my own designs in that style), at this point in the future, I think we can assume that ship design will have advanced a bit past the truss-and-tank designs. 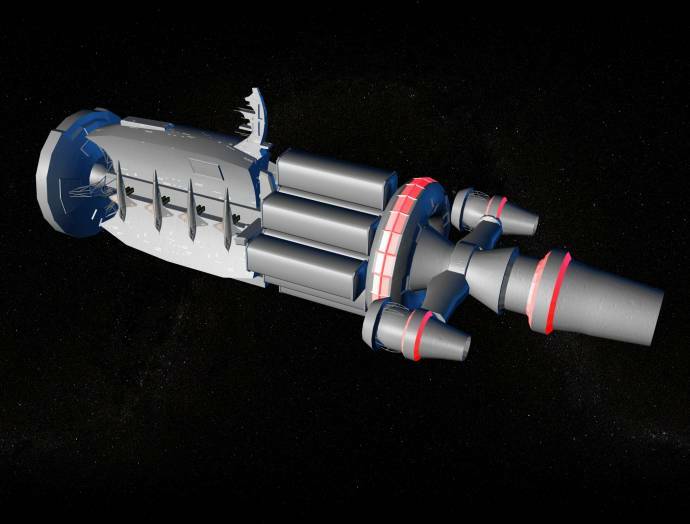 Since this is the case, you’d have a bit more artistic freedom, and I would propose that the design should be a bit more “iconic”, with the same spirit that Rodenberry went for with the Enterprise, minus the “you’re doing it wrong” deck orientation and asymmetry (here's a fun redesign I did). The visual design of the game (which of course is limited to the tech design... well, and the interface, but that’s another thread) should complement the gameplay; a relatively peaceful, serene, stately atmosphere. The player is not exploring these worlds in order to exploit/exterminate them. We’re exploring them to explore them (and possibly expand to them). 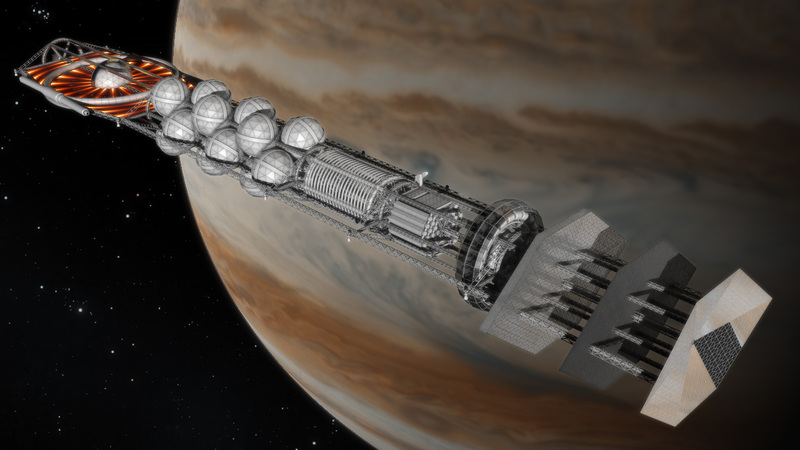 The ship should invoke a feeling not of “industrial power”, but more “post-scarcity zen”. If we want to keep the higher level tech, I think integrating advanced EM field manipulation with the design could help a lot. 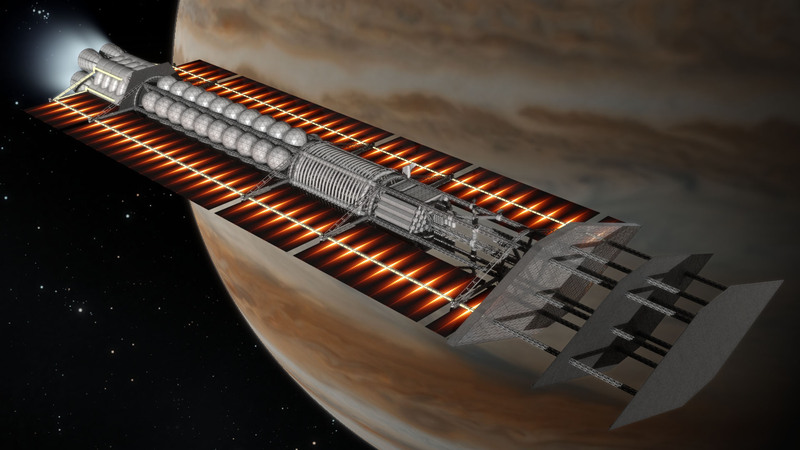 It would also give us a really unique visual element that fits with this more transcendant aesthetic; aurora-like flares rippling amongst the invisible field lines extending from the ship for hundreds kilometers, interacting with other magnetic fields or nebula gasses. The design might also or instead center around the FTL drive itself. Furthermore, I'd think that at this point in future history there'd be an optimal ship design. 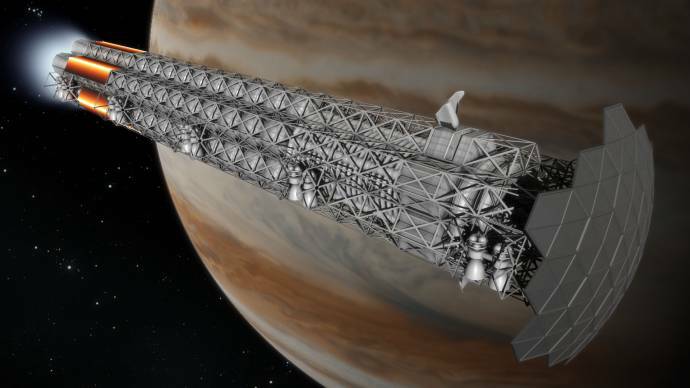 Instead of designing a bunch of different ships to upgrade and sell/buy (there shouldn't really be a material economy at this point either), I think you should focus on creating a really strong (both visually/conceptually, and literally) mothership. And in place of upgrading or modularity, I'd suggest focusing on unique, interesting gameplay, such as the infrastructure construction and managing beamed energy I described above. In a way, the game might have a more arcadey or puzzle-game feel, but that would be the result of applying so many realistic future technologies to the game world, and I think it would be a good fit for the more serene, exploratory style, anyhow. But, at the end of the day, I can only celebrate that I've found a project that at last takes realistic spacecraft design seriously! I can't comprehend how, out of so, so many space sims, there isn't one that approaches something like realism. Not even something as simple as mass symmetry!